An exquisite bamboo Seder Plate decorated in hues of blue, green, orange and cream with a creative and unique design on the edges of the plate. Food plays a central and important part in the Pesach Seder. The symbolic food such as parsley, bitter herbs and salted water are displayed on a beautifully decorated Seder Plate. 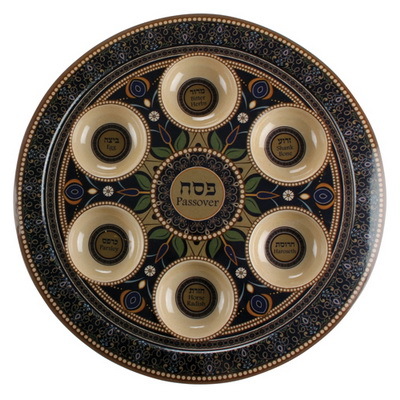 Generally, the Judaica plate is round and has a bowl for each of the foods to be arranged on.